The spat drew in Germany and France, which sharply criticised Trump’s decision to abruptly withdraw his support for a Group of Seven communique hammered out at a Canadian summit on Saturday, accusing him of destroying trust and acting inconsistently. Freeland reiterated that Canada would retaliate to US tariffs in a measured and reciprocal way, adding the country would always be willing to talk. When Trump left Quebec, it was thought that a compromise had been reached, despite the tension and the determination of European leaders Emmanuel Macron and Angela Merkel to push back against the US president’s protectionist policies. Trudeau had told reporters that Trump’s decision to invoke national security to justify US tariffs on steel and aluminium imports was “kind of insulting” to Canadian veterans who had stood by their US allies in conflicts dating back to World War I. The joint communique that was thrashed out over two days of negotiations in Canada vowed that members would reform multilateral oversight through the World Trade Organization (WTO) and seek to cut tariffs. White House economic adviser Larry Kudlow accused Trudeau of betraying Trump with “polarizing” statements on trade policy that risked making the US leader look weak ahead of the historic summit with Kim. Reneging on the commitments agreed in the communique showed “incoherence and inconsistency,” it said in a statement. Europe will implement counter-measures against US tariffs on steel and aluminium just like Canada, German Chancellor Angela Merkel said, voicing regret about Trump’s decision to withdraw support for the communique. The majority of Canadian exports go to the United States, making Canada uniquely vulnerable to a US trade war. Canadian officials, including Trudeau, have fanned out across the United States as part of a months-long charm offensive to appeal to pro-trade Republicans at every level. But even those vested in Canadian trade are not expected to come to Trudeau’s defense as long as the US economy is roaring. Trump has infuriated the European Union, Canada and Mexico by imposing tariffs on steel and aluminium imports. 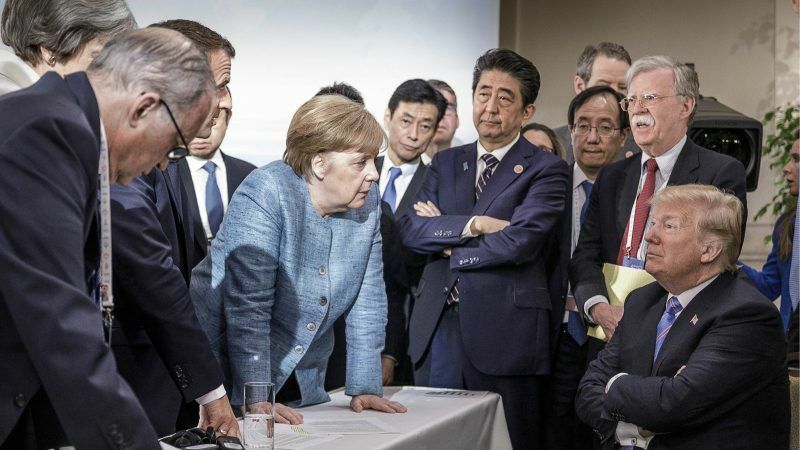 “The world as we know it, namely the US-led rules-based multilateralism, is now in serious danger of unraveling, as illustrated at the G7 meeting,” said Erik Nielsen, chief economist at Unicredit Bank. South African President Cyril Ramaphosa, who met with Trudeau on Sunday, said it was time for G20 nations to play a role and to “also bring about some good sense to all the key players.” “Canada’s Freeland, who met with US Trade Representative Robert Lighthizer on Friday, said she would speak to him later on Sunday, adding that she believed a deal to renew the North American Free Trade Agreement was still possible.